﻿ What are the advantages of the 100G XFP module? 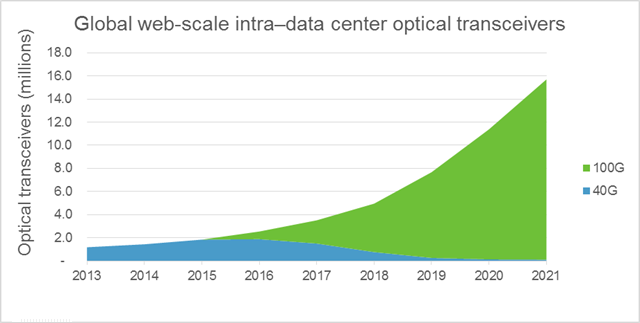 The 100G XFP transceiver adoption rate in optical landscape is consistently on the rise for the past few years. It is predicted that over half of the data center optical transceiver transmission will make the shift to 100G. The traditional 10G or even 40G may not be enough considering the explosion of data, therefore, 100G is going to become the new standard, and it has the following advantages. 100G now delivers a compelling price point, offering far greater capacity increases for the cost. And it still future-proofing the network with unsurpassed bandwidth. 100G offers the expansion and scalability to support the reliability, manageability and flexibility demanded of modern networks while preparing data centers for future bandwidth and speed requirements. 100G optical transport will not be enough for data intensive industries. Thus 100G is specifically designed to transport enormous amounts of data with ultra-low latency. 100G will be the preferred technology across long-haul networks. 100G networking can be customized, optimized, and easily expanded to allow for changes in the future. The market transition to 100GE is now in full force. The growth in 100G deployments will undoubtedly drive down the cost of 100G transceiver modules.